My client requires a certificate of insurance for me to act as counsel. How do I get one? In many instances, your Declarations page (which was provided to you with your annual invoice and is available electronically), will serve as sufficient proof of coverage. The Declarations page outlines the coverage provided to you, including policy period and coverage limits. For your convenience, a PDF copy may be downloaded from My LAWPRO. Go to Primary Policy Documents and choose the applicable year (e.g. – 2018 Policy Wording). 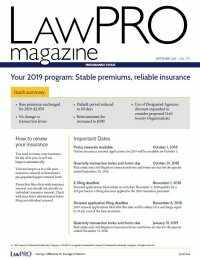 In case the Declarations page is not sufficient for a lawyer’s needs and an actual Certificate of Insurance is required, it can also be created and accessed directly from My LAWPRO. Click on the “Primary Policy Docs” tab, scroll down to the bottom of the page to the Certificate of Insurance heading, and click on the “Request for Certificate of Insurance” link.